Want to guess which U.S. carrier sold the most smartphones in Q1? Verizon, right? After all, Big Red is the nation's largest carrier, so it must be Verizon, right? Wrong. Hmmm. AT&T, then, right? They are the nation's second largest carrier so if the answer isn't Verizon, it just has to be AT&T. Right? Wrong. The nation's third largest carrier, T-Mobile actually sold more smartphones than any other stateside carrier in the first quarter, according to Counterpoint Research. If you believe in trends, this might not be much of a surprise after all. In 2014, T-Mobile surpassed Sprint to be the third largest smartphone purveyor among U.S. carriers. Last year, T-Mobile topped AT&T to become the second largest smartphone seller among the wireless operators. And now, Verizon goes down. During the three months from January through March of this year, T-Mobile (including its MetroPCS pre-paid unit) was responsible for 23% of the smartphones sold in the states. Verizon claimed 22.2% of smartphone sales during the same time period, followed by AT&T's 20.2%. Sprint had 16.7% of handset sales in the quarter. 8.6% of smartphone sales in the U.S. during the quarter were sold by carriers outside the big four, and 9.4% were "open channel" sales not connected to any wireless operator. The report also revealed that smartphone buyers are now holding on to their handsets longer than the two years that used to be the average. That is due to the end of two-year contracts and subsidized phone purchases. T-Mobile was the first of the major U.S. carriers to eliminate subsidized phone purchases, and over 90% of its customers are sporting a phone that wasn't subsidized by the wireless operator. Probably because T-Mobile added more new prepaid customers while also having a lot more BOGO deals and so on. 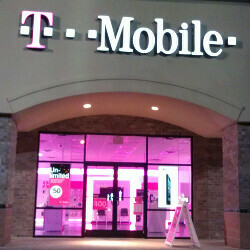 T-Mobile is doing good but they still have a long way to go to really stand beside the red and blue giant. I'll probably never leave T-mobile again. Work made me move to AT&T, disaster. Then I did Sprint, actually better than AT&T but still sucky. This year, T-mobile again, hallelujah. The problem is, TMOBILE 4G is so crowded it's slow. As. Rowed as VZW is, is still faster than TMobile. I like the low pricing compared with VZW, but it comes at a cost of speed. But I like streaming video now at no cost to my data. I don't even need Comcast anymore as soon as the contract is over, they are history. Not really, depends on what area you are in, in my area T-Mobile is faster. Are you talking about T-mobiles LTE network or hsdpa+ network? T-Mobile LTE service is about 25% of the speed of Verizon's LTE, but the coverage is catching up quickly. We have 6 places in this small area that sell Verizon and not one T-Mobile store. I would like to see some actual numbers rather than percentages.